Navigate your way around Salesforce. Search for data in Salesforce. In this unit, we’ll walk you through how to navigate Salesforce. Then we’ll take you through some easy customizations that you can make to optimize your use of Salesforce. Finally, we’ll give you some tips on how to make the most of Salesforce’s global search. Scroll down to the challenge at the end of this unit and click Launch your hands-on org to open your Trailhead Playground in a new browser tab. You’ll want to have a practice environment as we walk through making some basic changes in Salesforce. 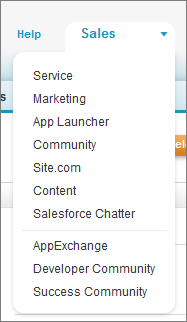 At the top of each Salesforce page are tabs and links for navigating to major features. Use the tabs to switch between objects and features. You can customize this list to suit your needs (more on this in a bit). Search to find any type of record. Access user-specific customizations from the drop-down next to your name. Access help resources and training. A list of apps, each of which contains different features and tabs. If you don’t see the tabs that you expect to see, select a different app from the app menu. When you log in to Salesforce, your first view is likely the Home tab. The items displayed vary depending on your edition, layout, and customizations. A default layout includes these items. A sidebar where you can create records, jump to your recently viewed items, add handy links, or restore items that you’ve deleted. The same sidebar appears on most pages. Your Chatter feed, which allows you to collaborate with colleagues in context, all in Salesforce. Your feed can be collapsed (as shown) or expanded by clicking Show Feed. Dashboards showing up-to-the-minute results from several reports. Dashboard information refreshes whenever you reload the page. 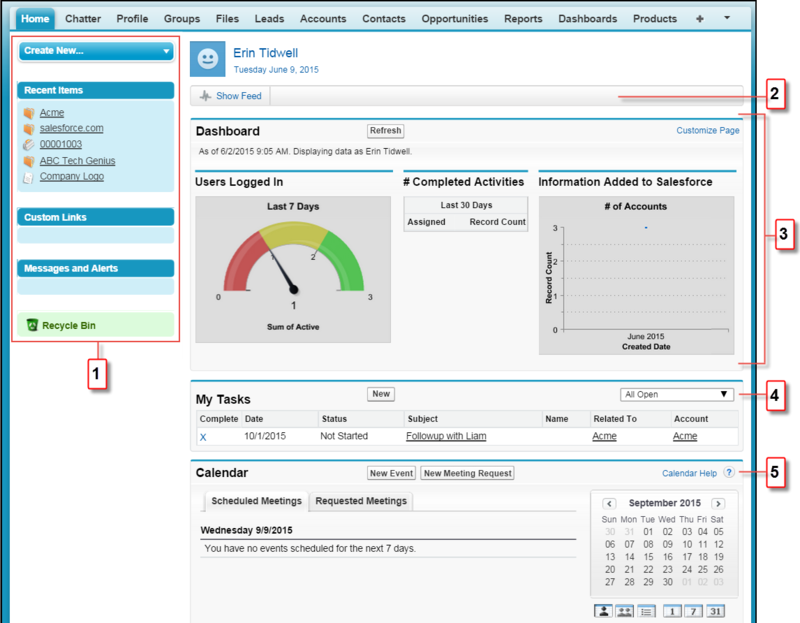 Your open tasks in Salesforce, with the option to filter by date range or view all open tasks. If you don’t see them right away, scroll down, or collapse the Chatter feed to move Tasks up. Your calendar of events in Salesforce, including options to create events. We’ve set up the Home tab with some features we think you’ll find useful, but you can customize what’s on your Home tab. For example, Jose, the Cloud Kicks sales manager, wants to see how many opportunities have been open more for more than seven days, so he added a type of visual graph called a dashboard below the Chatter feed on his home page to review his team’s performance at a glance. Let’s walk through what you see on the Accounts tab. Make sure that you’ve selected Sales from the app menu, and then click the Accounts tab. A dropdown menu for list views related to Accounts, which includes standard list views and any custom views you’ve created. You also see links to edit existing custom list views and create custom list views. 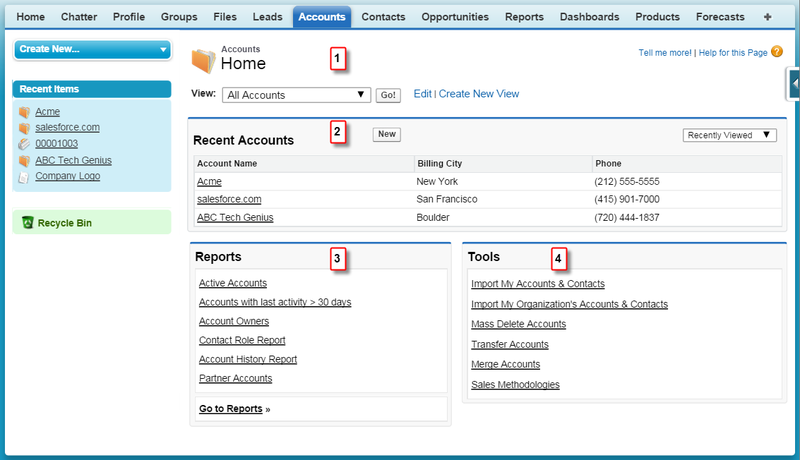 List views are a way for you to browse a set of records in Salesforce. In the example below, this list view shows you all account records you have permission to see. Recent records, with the option to filter on recently viewed, modified, or created. You can also create a new account by clicking New. A set of links to commonly used account reports. Account-related tools, including import and merge utilities. On the Accounts tab, click the New button to create an account. Enter any name in the Account Name field and click Save. Depending on the configuration, you might see a different view when you log in to Salesforce. If you’re using your Developer org, you see something similar to this. Scroll down below the record details. Related lists group and display links to other records associated with the one you’re viewing. You can change the list order so that the ones you use most are higher up. Both users and administrators can customize Salesforce. Users can set their own personal customizations. Personal settings are visible only to the user who sets them up. 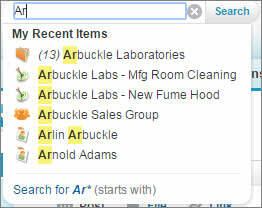 For example, Candace, the Cloud Kicks salesperson, personalized her tabs by moving the Cases tab next to the Home tab. But Jose, the sales manager, preferred to keep Accounts and Contacts to the left, followed by Opportunities. Access personal settings by clicking your name, and then selecting My Settings. Administrators can make changes to the setup for an entire Salesforce org. Organization-wide settings affect all users, although a user's personal settings can override certain organization-wide settings. For example, if Linda, the Salesforce administrator, enables Salesforce mobile for the org, any user can access their Salesforce account using the Salesforce mobile app. Access organization-wide settings by clicking Setup in the upper right corner of any page. Setup is available to users with the Customize Application permission. These users are typically referred to as administrators in Salesforce documentation. Salesforce search is smart. How smart? Search fills out the crossword with pen. Search actually read Ulysses last summer. And search can figure out the tip on restaurant bills without a calculator. Yeah, that smart. We’re not saying this to brag. We’re telling you this so you understand that when you search in Salesforce, you can relax a little. Don’t worry, search happy. We also know that when you want to find a record, you don’t want to waste any time. So here are a couple of tips to search smarter. 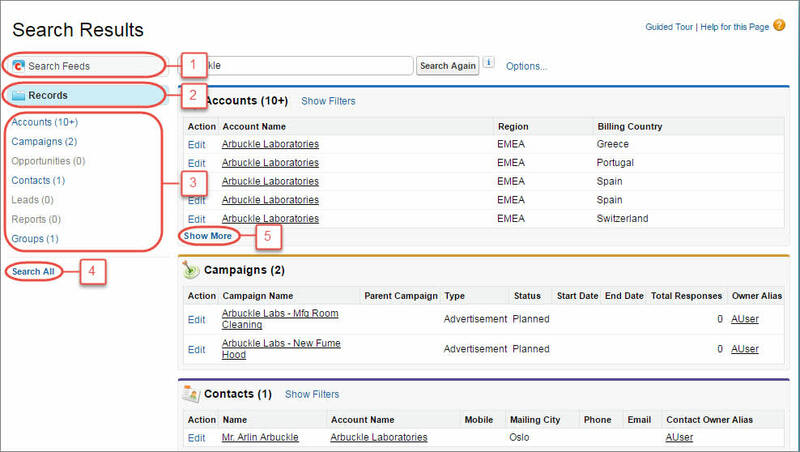 Global search, at the top of each page, searches across all searchable objects within Salesforce. As you type, notice the drop-down that lists My Recent Items and highlights the part of the record name that matches your current search term. Always give instant results a quick peek before you continue. Chances are, your record is just one click away. When using global search, be as specific as possible when you search. Being specific gives you the best, most targeted results. What do we mean by "specific"? Let’s say you're looking for John Smith from your sales team. Enter his full name. If you’re looking for the sales report from March 2015, enter sales report March 2015. You’re probably thinking: Well, that’s all fine and good, but what if I don’t know any specifics? Or even the correct spelling. Don’t worry: enter what you know. Search has some cool features for spell correction that kick in automatically. Plus other features that widen the net of results by returning matches for synonyms (if enabled by your admin) and related terms (like sell, selling, and sold). And our relevance model makes sure that the most relevant results are at the top of your list. Once you’ve pressed Enter, you’re finally at the search results page. Look around, because here’s where you can really become a search hero. Let’s start on the left side. You can easily get to (1) Search Feeds to see posts from your company that match your search terms. If you’re on the Records view (2), you see a few records for each frequently used object. By clicking an object name in the left search navigation (3), you can see results only for the selected object. Simply click Search All (4) to see the results for more objects. Use Show More (5) under the object search results and see all results for the object. The order of the objects is based on how frequently you use an object. The order changes along with your search habits, which is another example of just how smart search can be. If you find that you don’t use an object that frequently, but still don’t want to scroll through the list to find it, try pinned lists. Hover over the object name to pin and unpin the object. A pinned object always shows up in Records, even if it’s not used frequently. If you can’t find the record you need right away, it’s time to do some refining. You can either sort results by clicking the headers or filter the results by clicking Show Filters. The filters pane lists each of the displayed columns with drop-down or text fields for you to refine results. Enter a term or select an item and click Apply Filters. Admins enable filtering and define filter fields for each object. So if Show Filters isn’t shown or if you can’t filter by a specific field, ask your admin for help. You’ve learned how to use the most specific search terms, how to narrow results by object, and how to sort and filter results. But what if you still can’t find a record? Make sure that you are on the right object scope. You can change the scope in the left navigation. Check your spelling and verify that you entered the full search term. If you recently created or updated the record, wait a few minutes for the record to be made searchable. If you can’t find your record after 15 minutes, contact your admin. Now that you’ve started to learn your way around Salesforce, let’s walk through some easy customizations that you can make to optimize your experience. These customizations aren't global changes for all users—they’re specific to your personal view in Salesforce, even if you're an administrator. Don’t like videos? Let’s walk through it. 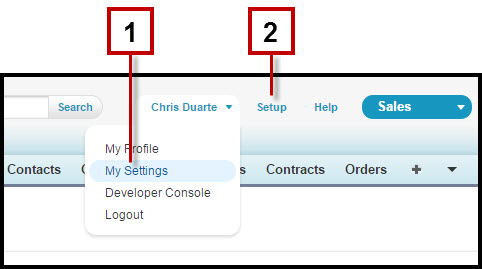 One of the easiest and most effective customizations that you can make is to change the tabs that appear when you log in to Salesforce. You can add and remove tabs (1), plus change the order of the tabs you see (2). Try it out. 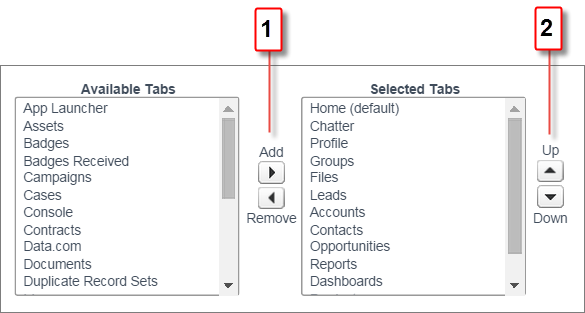 Click any tab under Available Tabs, and click the right arrow to add it to Selected Tabs. Then click any tab under Selected Tabs, and either remove it with the left arrow, or move it up or down with the corresponding arrows. Now that you’ve mastered that, let’s change some page layouts. 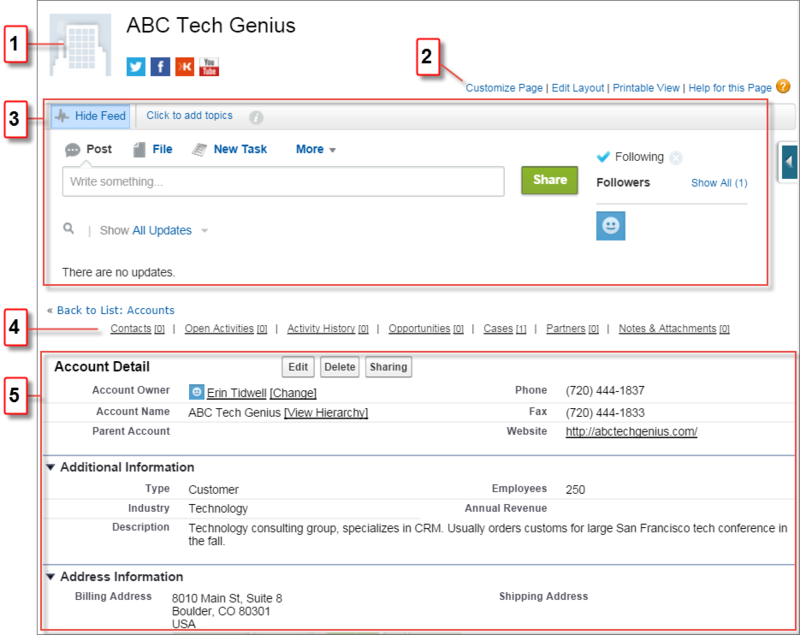 You’ll remember we walked you through an account record in Salesforce, and showed you related lists on the page. These related lists contain records on other objects related to the main record. Typically, a page layout has many related lists. You can customize which ones you see and their order. You’re already in the Display & Layout section of your user settings. This time, click Customize My Pages. Select Accounts from the dropdown menu, and click Customize Page. 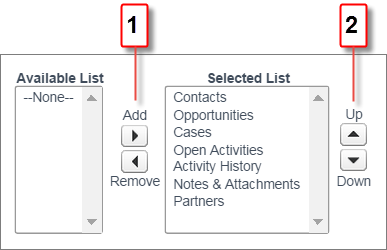 You can add and remove related lists (1), plus change the order of the related lists you see (2). Give this one a shot. Click any list under Available List, and click the right arrow to add it to Selected List. Click any list under Selected List, and either remove it with the left arrow, or move it up or down with the corresponding arrows. Once you’re done, navigate back to any account record by clicking on the Accounts tab and open an account to see your changes in action. Now let’s work on your email notifications for Chatter. This is a common pain point for many new users, but it’s easy to address. Since you’re still in My Settings, click Chatter, then Email Notifications. Now you can set your preferences for when to be notified via email regarding Chatter activity. For example, you might not want to be notified when you have a new follower or when someone likes your posts, but you want to receive a notification when someone mentions you on Chatter. You can also set your preferences for what types of notifications to receive for Chatter groups that you join, including receiving a daily or weekly digest. If you set your default preference for Chatter group notifications now, you don’t have to come back and update your settings each time you join a new Chatter group. Watch a video on personalizing Salesforce to your business. Get more from Salesforce with our educational webinars.